Last year I gave my husband one of those beer making kits for Christmas. He thought it was the coolest thing. 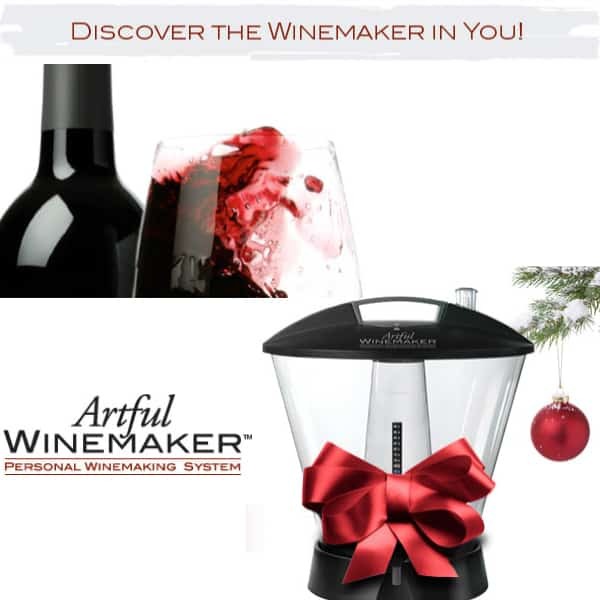 So when the makers of the Artful winemaker contacted me to see if I wanted to try out their system to make wine at home, I couldn’t wait. I honestly don’t know alot about making wine. I have participated in making homemade fruit wine in the fridge with my mom, and have made blackberry wine as a kid, but never what I would consider “real” wine. This winemaker makes wine making at home super easy. It’s even easier to me than homemade wine. All you do is follow the simple directions, step by step. Today is Day 14 with my wine, and everything is going well. I can’t wait for Day 28 when we get to bottle it! Last weeks giveaways have spilled over into this week, because today we’re offering one lucky reader one of these fancy little winemakers valued at $150. But if you think this would be a good gift you would like to get for a friend or family member, they are on special for just $99 through the end of the year. This package includes everything pictured below. We’re making the Cab right now, I can’t wait. To enter for a chance to win your very own Artful Winemaker, just leave a comment below. 2. Tweet about this giveaway using the tweet button below the post. Giveaway ends December 7, 2011. Giveaway open to U.S. and Canada. I received a winemaker for review, but all opinions are 100% my own. I would love to learn how to make my own wine! What a great giveaway! This is so cool! I would love to make wine at home, I wonder if you can do the sweeter wines as well? I’d love to see if I could produce something drinkable with this kit! And I shared it on facebook. This would so be the perfect gift for my sister. She works at a wine bar and this would be so fun! I’d love to try and produce my own wine. I love trying new things and this is right up my alley. Thanks for the giveaway! 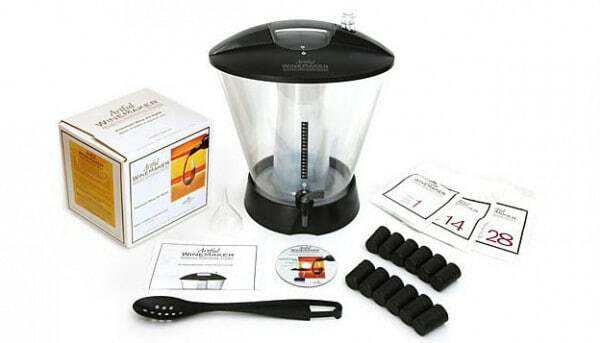 I am intrigued at the thought of making my own wine and would love the opportunity to win this kit! Thanks so much for making this possible! What a great giveaway! Thanks for the opportunity! We love wine! oooh! I love the thought of making my own wine to add to my collection. I, too bought my hubby the beer making kit last year (beer=blech!) and would love to show up my hubby. I’d love to try making wine, sounds like fun. My parents used to make their own wine when I was little. They’ve since stopped, but did enjoy it and still use some of their own wine they made way back when for cooking and entertaining. This would be the gift to end all gifts for my dad, especially now that he’s considering retirement. I shared on twitter (@MNHuber)! I’ve never tried making beer or wine, but it sounds like fun! Great giveaway! I’d love to make my own wine! I’ve been wanting one of these forever. Please enter my name in your draw for this amazing winemaker. Thanks!! So fun!! Who would have thought you could do it at home? I know a few people that this would make the perfect Christmas present for! I’d like to do our own wine. I have friends that already made potato wine and it was so good. This looks like an interesting contraption! It would be fun to try it, I hope you had fun!! Wine making kit sounds fun! How cool – I love wine, but never considered making my own! I didn’t even know this was possible! So cool. Sounds like fun! Great giveaway. I know a couple people that really love wine. this would make a wonderful gift. This would be so much fun – how awesome would it be to have a dinner party and serve our own wine? I love wine! Count me in to win! What a great gift idea and for yourself to have at home! I may have to give this a whirl! Hi Angie. I found your blog when looking for Artful Winemaker users. I have one of these systems and we LOVED it! I was very disappointed to learn that they were going out of business. I downloaded the info about downsizing a larger wine kit to use with this system, but have not yet tried this. I was wondering if you still use your kit and have done this. Hope to hear from you..